And again this year we didn’t make it across the border through the Spiere-Roubaix canal. After we cruised it in 2012, just after it had been re-opened, there was a different reason each year that prevented it. It was closed, water-level was too low, lock out-of-order etc. etc. This time according to the lady in charge we should be able to do it. Good for us we met a fellow skipper in Antoing who informed us that he had run aground, having a draft of 80 centimetres. So via Valenciennes it was and for now we’ll stop trying. 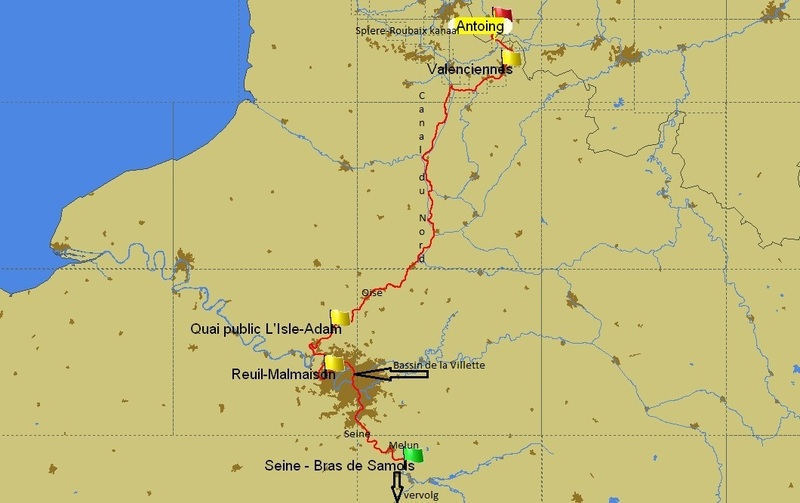 We had already decided to take the Canal du Nord to go south, the most commercial and fastest route. Some people dislike the big ships there but they don’t bother us and, once you’re in the flow, you can make good time ‘cause the commercials are in a hurry; it is 19 locks and a 4,5 k tunnel over a total distance of only 95 k.
The Canal du Nord is okay, but a dry and sunny spell would make it better stil. In the canal is the Riqueval tunnel, quite a stretch with its 4,5 k, but also spacious and well lit. Michel wanted to be certain and didn’t want to be bothered by the bimini so he lowered it and – being at it – he set it at its lowest. The two struts at the front then get through their “dead” point, but that causes no problem. We have done that before and if you give them a hand the electric raising thingy gets it all back up again. The reader will understand our chagrin when we found that the tent could not get up after passing through the tunnel. What and how has happened exactly we still don’t understand but the spindle-arm – that lowers and raises the tent electrically – had come down too low and could not get the tent back up. The whole of the frame and tarpaulin is so heavy that getting the thing up by hand, up to where the drive could take over, is out of the question. At first we just were very annoyed but finding a solution is just Michel’s thing …… and yes! The crane at its highest position, cable run out. Rebecca on the fore-deck to operate the crane and the camera, Michel on the aft deck and both armed with a walkie talkie. Hooray, everything up and running again, although …… something funny has happened. We would have understood if the frame had been bent a little, upwards that is, by the force of the crane but to our amazement it was bent downwards, against the pull, how the peep could that happen? The weather had gotten better so it was a good plan to stay in l’Isle-Adam for a few days, a nice little town on the Oise river, a pleasant stay. A bit of work in the garden, lush with all the rain, the violets still blooming, not like other years. In the winter we received an email from some Frenchman who asked for information on our engine. It led to quite an exchange of mail and Michel has been able to supply information and help him in ordering an engine himself. Should we ever be near, we had to come and see him and raft up. Well, that would be on our route to Paris, on the Seine at Rueil-Malmaison. So we arranged for a stop with Stéphane and his family. We asked Stéphane if he knew of anyone who might be able to help fixing the frame and he said that maybe he would be that guy. Michel and Stéphane have bent the frame to its original form. So now we can use the tent again, but we don’t lower it so far again. We made a provisional stop to prevent it from sagging and the definitive solution is on the winter-to-do-list. The men working real hard I could try out my latest buy. It’s not really unpleasant to turn a bit and being moved by the wind but I am not really convinced that it is my thing; one of these days I’ll give it another try. And then to Paris where we stayed for over a week and our son with his girlfriend had the opportunity to discover Paris. Gotten wise after last years experience with a bike bein’ stolen and noisy nights with people coming on board we came well prepared. During winter Michel had improved on last years solution and together with the ramp it worked wonders. At bedtime we raised the ramp and could get a quiet sleep, great. We didn’t mind leaving Paris, it is very crowded and full and after three consecutive years of mooring there we’d gotten a bit blasé J. We did something new this time, we took the dinghy to cruise on the Ourq, a canal that joins Paris to the Marne, but can only be sailed a short stretch. Really up Panache’s street as for him the dinghy tops everything. We are now starting that part of the journey that we have really been looking forward to, Burgundy. Via the Canal St. Martin to the Seine and there, at the Chinese, keep right following the Seine instead of left onto the Marne. That Chinese is a frightfully big restaurant, right at the corner of the junction, a landmark for everyone who cruised there. At the Chinese, turn right, look at the map. When you are leaving Paris towards the east you spot along the banks, just like when you are entering via Canal Saint Denis, how people try to build their “home” with tarps, broken caravans and car wrecks, amidst indescribable rubbish. And then all of a sudden a spot where the inhabitants really have made the effort to make the most of it. I find it hard to sail past each time, it emphasises the differences in a clear way. And also I wonder if it is all down to bad luck or if it is free will. In this region, there being a lot of commercial boating, maintenance on locks and waterways is kept up. Complete lock systems are renovated like here on the Seine were even the footbridge over the lock is new and a huge mirror is added so you can spot your own ship entering. Art or functional??? After a stop over in Melun, from where we biked to the very impressive Château Vaux le Viconte and adjoining gardens, we are now in Samois-sur-Seine. Just a few weeks early for the annual Django Reinhard festival. 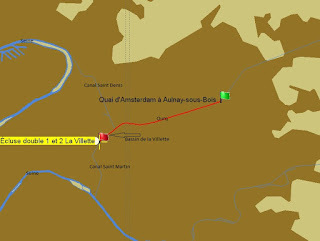 Tomorrow we will continue and turn off the river onto the canals. There will be more mooring opportunities there as we are no longer dependent on quays and bollards but can drop our spud legs whenever we spot a nice spot. More about that in the next blog.